The following are shows that I hope to attend during the coming 2008 season. Of course, all are subject to confirmation so please check with the organisers before travelling with your vehicle. Most shows require pre-booking to obtain a pass. Well, a rainy day, light drizzle that never seemed to stop. As a static exhibit (my clutch is too stiff to put up with the parade at 2-3mph) my car was hidden away down a side street where no-one saw it. Added to the £5 entry fee it's probably the last time I'll be at this show. I sent a fairly long letter in with my ticket application and didn't even get a reply. A much better day than recently at this venue, with a decent turn-out from our club. 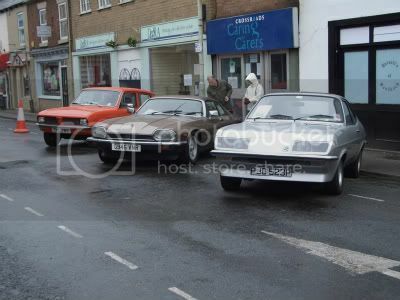 For this show I was with the South Cheshire Collectors Car Club (SCCCC) with a range of different makes of vehicle. Attended as part of the Droop Snoot Group, we shared a stand with the VOCS club for VX4/90 and related vehicles. Saturday was a lovely day, but it all went bad on Sunday with rain from when we arrived until just about time to leave. Some of the autojumble was packing up just after lunch, some of the VOCS club didn't appear from their tents until about the same time. Another one with the SCCCC saw just two of us on the small stand, but a massive turn-out from a wide range of other clubs made this a major show. Weather stayed nice for the whole day. 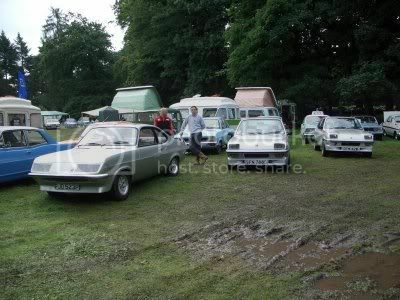 This time we joined with both the Viva Drivers Club and the VOCS VX4/90 in the back corner of the showgorund. Saturday was again quite reasonable, but heavy or torrential rain overnight meant that the ground was quite damp on Sunday morning. It rained so hard that those who camp overnight at the showground didn't even make it as far as the beer tent. A good turnout from all the clubs meant that the stand won an award from the stand. DSG cars included HPFs from myself and Barry, and HS Chevettes from Phil and Tony. An ex-works Audi quattro sport on the nearby Knutsford Motor Club stand provided a lovely soundtrack when they periodically ran the engine. A re-arranged show due to the poor weather earlier in the month allowed me to bring out my Vauxhall Sportshatch. The car has been sold to its previous owner for export to Australia, and it was nice to be able to take it to one last show before it leaves. Unfortunately the weather was still nothing special, and attendance was down because of other shows clashing with the new date. However it was a good show as always, with the pleasant setting helping.